The mission of PFSNRA is to assist the food system by providing scientific expertise needed to address current food safety, nutrition and regulatory issues affecting Canadian consumers. It accomplishes this by serving as a conduit for collaboration between scientists and health professionals from universities, food industry, government and non-governmental organizations, with the common goal of achieving a healthier Canadian population. 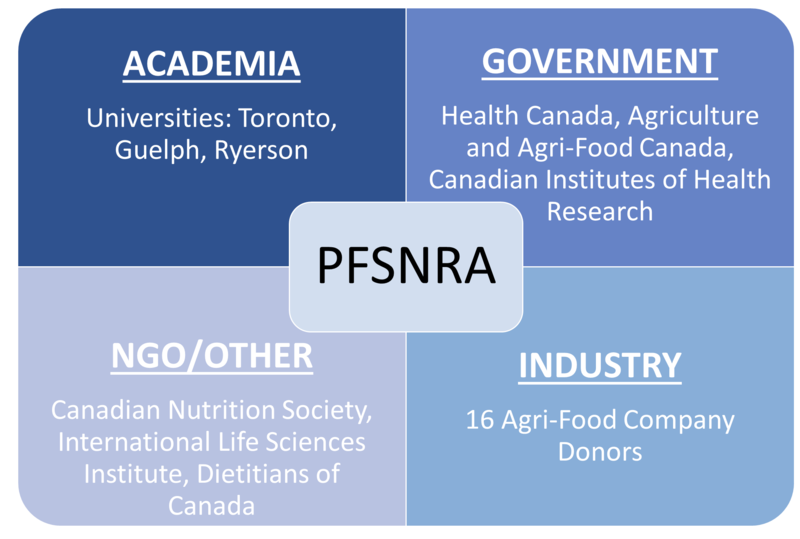 The PFSNRA was established in 1992 with support from the Natural Sciences and Engineering Research Council of Canada (NSERC) through a peer-reviewed initiative, the University of Toronto and members of Canada’s food industry. 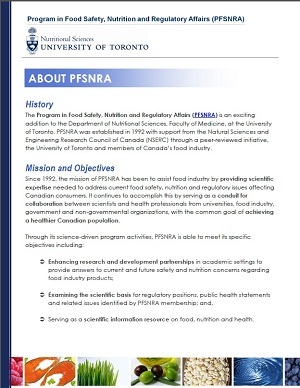 Since it's conception 24 years ago the PFSNRA has been housed in the Department of Nutritional Sciences, Faculty of Medicine, at the University of Toronto, operating the University-Industry Affiliates Program Office. Here the PFSNRA facilitates communication among industry members, academic scientists, government representatives, consumers and health professionals on key food safety, nutrition and regulatory issues. The University-Industry Affiliates Program Office is PFSNRA’s link with media and health professionals, providing access to accurate information on the safety of our food supply and the role of nutrition in health. The PFSNRA is a unique program bringing together all stakeholders in the food system including university researchers, government, industry and other non-profits and organizations. The strength of the PFSNRA comes from the combining of expertise from these sectors in order to address food, nutrition, agriculture and health issues. Each year the PFSNRA publishes a brochure to highlight the recent activities, as well as introduce new users to the structure, history and previous work of the group. Please use the link below to download the 2017/2018 PFSNRA Brochure.